The hype cycle is a change curve model for the social attention to, investment in, and the adoption of potentially disruptive new ideas or technologies. It was developed by Gartner, the market research and advisory firm behind the Magic Quadrant marketing category model described earlier. 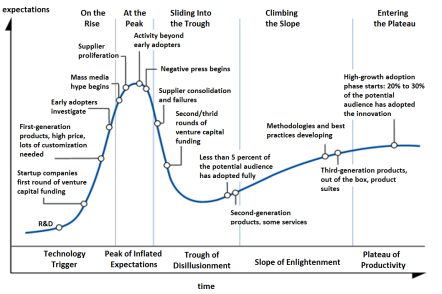 The hype cycle as Gartner depicts it has five stages (see picture below), as follows: The first stage occurs when a Technology Trigger (potential breakthrough) materializes, and first-generation (expensive, customized) products or demos are produced. Increasingly, this potential breakthrough gets popularized by industry insiders or the general press, and a Peak of Inflated Expectations (to remember this stage, think of “PIE in the Sky” thinking and action) occurs. Entrepreneurs, evangelists, journalists, investors and impatient future-thinkers all have strong social and economic incentives to portray the state of the science, technology, or product to be much more than it is or can be in the near term. These first two stages are the hype stage, after which the cycle is named. In the third stage, we see an aptly-named Trough of Disillusionment, where various scientists, engineers, journalists, investors, and public react negatively, sometimes strongly, to the previous hype, and their stories create their own negative counterhype, sometimes pushing social expectations below where they deserve to be. Until or unless the product improves itself, market interest wanes, investment capital dries up, first-round competitors run out of startup funding, and slow-moving R&D initiatives may at this stage be prematurely terminated by short-sighted managers. Gartner calls stage four the Slope of Elightenment, and they draw it with a negative second derivative (curving down over time), but this isn’t the most common case. We should instead call this phase the Slope of Exponential Performance, as it is typically a slope that is gently curving upward in product performance and adoption, throughout the entire stage. Only at the end of the stage does it go through an inflection point and start to curve downward, as a Slope of Saturation, in the last phase of an S-curve. The Slope of Exponential Perormance starts when the product enters a second-generation, usually much later than hype predicted, and starts to climb beyond early adopters (5-10%) into larger market share. Again, Gartner calls stage five the Plateau of Productivity, but as we’ve said, this stage is also somewhat misnamed, as it is best understood as a stage of increasing market saturation, a Slope of Saturation, the familiar S-curve of product and technology adoption. Beginning in stage three, as real growth finally gets started, various professionalization, standardization, and best practices begin to take hold, and third-generation products and services emerge. In stages four and five, some of these are finally good and cheap enough to move the product into its last markets, creating market saturation, for that particular product at least. The hype cycle attaches itself to a special class of potentially disruptive growth curves, where various self-interested actors unconsciously work together to overhype the story and timescale of new product or service development, and capture value as soon as they can plausibly do so, typically well before the technology is ready. The sexier the technology’s potential seems (3D printing, genetic engineering, brain-machine interfaces) the more overoptimistic and accelerated the hype. Predictably then, human greed and unconscious or conscious dishonesty, in the form of overclaiming and lack of critical evaluation are always part of the modern story of disruptive new technology attention, investment, and adoption. Tesla is a good example of a company led by a CEO that has been using and stoking the hype cycle since its inception. Elon Musk is constantly being hyperbolic in his own vision of the future, and displaying an aspirational reach that exceeds his grasp. Whether Musk can find enough investors to buy into his vision, investors willing to ride out the trough of disillusionment as execution and profits are slower to materialize than anticipated, is still an open question. Hype is a dangerous tool to use. Amazon, by contrast, is led by a CEO, Jeff Bezos, that has generally avoided hype, though it has an equally grand long term vision. It also courts long term investors willing to be patient, and watch the company operate at a loss for years, as long as it is gaining share. Between the two approaches, the Amazon approach is much safer, and it remains to be seen how Musk fares. I for one wish him well and would love to see him tone down his hype. 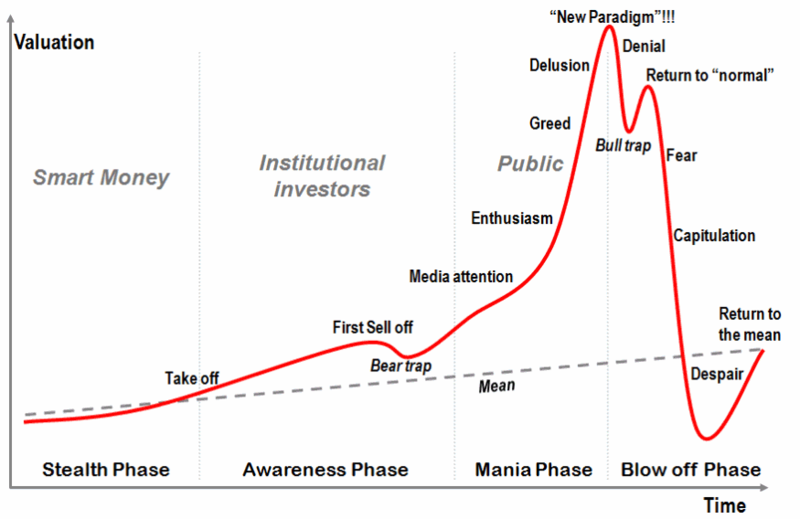 At left is a useful update of the hype cycle reenvisioned for investing. This cartoon model, the Four Stages of a Bubble, was developed by transportation geographer Jean-Paul Rodrigue. Bitcoin, and cryptocurrencies in general, offer great examples of this cycle at present. Keep in mind that as the S-curve of technology adoption occurs for any valuable new technology, or for the stock of any company offering that technology, successive bubbles and corrections will occur all the way up to market saturation, which may take years or decades. For particularly interesting or valuable technologies, that means, many successive phases of Mania and “Blow Off” will occur. A smart investor in any valuable technology or service that is still early in the exponential phase of its S-curve adoption will stay in the market for most of the time on the way to market saturation, exiting only for short periods during significant downturns. Tony Robbins and Peter Mallouck’s Unshakeable: Your Financial Freedom Playbook (2017) offers some great data on that particular strategy, and is well recommended. A better model for tracking technology development (first-gen, second-gen, etc.) than the hype cycle is the technology readiness level (TRL) model, originally developed by NASA and the US Department of Defense for use in technology assessment, transfer, and management programs. TRL models tend to disregard socioeconomic factors that incentivize overpromotion of immature technologies, so they should be combined with the hype cycle model to forecast social attention, investment, and adoption cycles. 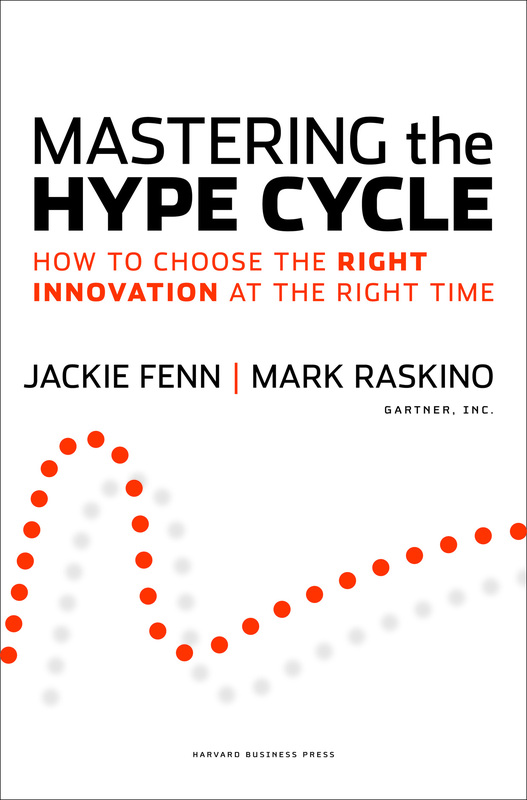 For good tips on how to manage these classic attention, investment, and adoption patterns, see Fenn and Raskino’s Mastering the Hype Cycle (2008). Both authors are Gartner Fellows. When your team is aware of a hype cycle, they can use countercyclical (contrarian) strategy wisely. For example, in R&D and startup situations with great new technology it is usually wise to stay in stealth mode as long as possible to avoid triggering inflated expectations, which will attract competition. Conversely, if you don’t believe a technology yet has enough engineers or money working to make it real, you might yourself trigger or jump on a hype bandwagon. Some sly competitors will engage in aspirational promotion of a next gen tech or platform, but are careful not to overinvest too early themselves, and instead wait to buy others assets once they enter the trough of disillusionment. If you are a large company considering acquisitions, purchasing a company at end of its trough of disillusionment, just as second-generation technologies are nearing market, or waiting until third-generation and the start of exponential growth, may be the wisest strategy. For a contemporary example of the Four Stages of a Bubble, Bitcoin seems to fit the bill very well. And although more difficult measure, the Hype Cycle immediately brings to mind Tesla. Thank you Graham! I agree entirely. I’ve added both examples to the page, and really appreciate the helpful feedback. Warm Regards, John.